The Volvo S60 R-Design is favored by owners who desire sporty elegance. Inside and out, the S60 does not disappoint with its athletic curves and lines to the lush interior. The 2019 S60 models have arrived in Santa Rosa. The robust body has deflectors on the front and the rear of the vehicle along with a rear diffuser, which was created in contrasting black along with integrated duo-split tailpipes. Chrome accents and black inserts enhance the main body color, which gives the S60 R-Design a more sophisticated appearance. On the inside, aluminum mesh inlays accentuate the dashboard and doors. The contoured seats feature Nappa leather and ventilating fabric to enhance year-round comfort while serving to dampen road vibrations. 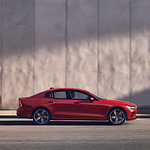 The Volvo S60 R-Design also has a number of entertainment and safety features that must be appreciated in person at Smothers European Volvo Cars. Feel the luxury and performance of the S60 by going for a test drive.